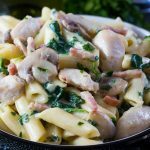 This recipe for Creamy Chicken and Bacon Pasta is a rich and delicious one pot dish that's simple to make and ready in just 30 minutes. 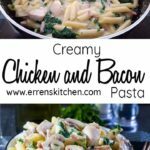 This easy recipe for Creamy Chicken and Bacon Pasta is a rich and delicious one pot dish that’s simple to make and ready in just 30 minutes. 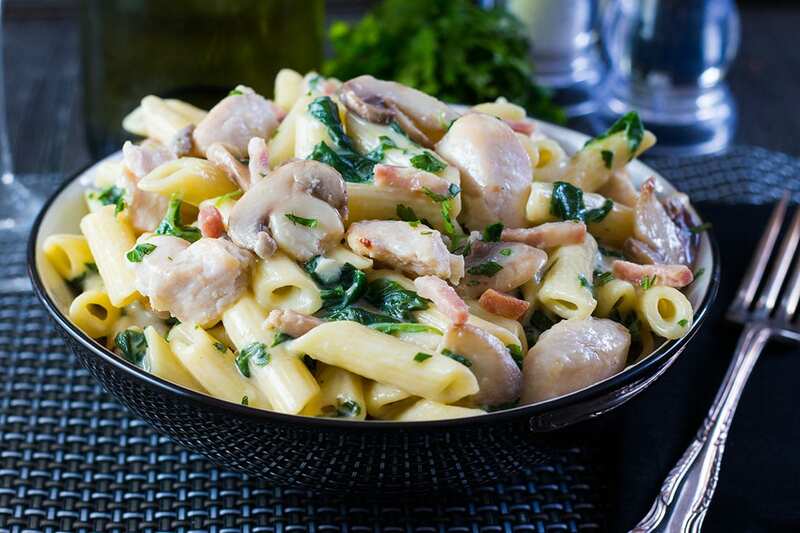 This Creamy Chicken and Bacon Pasta is made up of chicken, mushrooms, spinach, and beautiful creamy garlic sauce that’s pulled together with the salt and smokiness of the bacon – heaven on a plate! 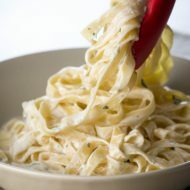 There are a lot of pasta dishes out there, but there’s nothing better than a really good, classic pasta dish. 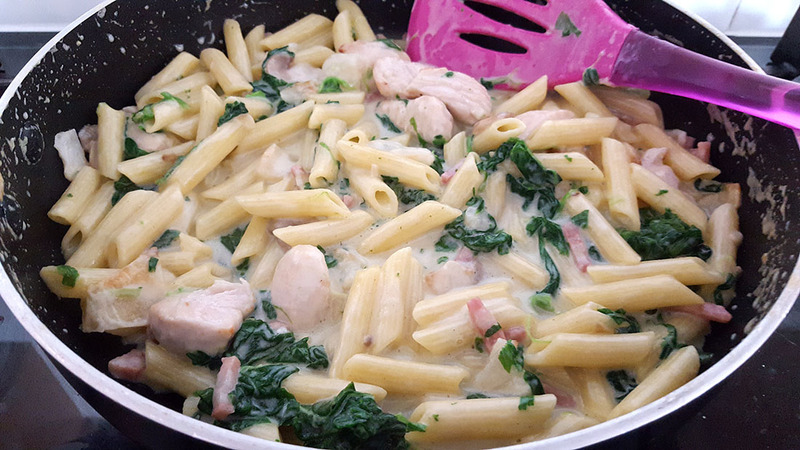 So I give you this Creamy Chicken Bacon Pasta recipe. 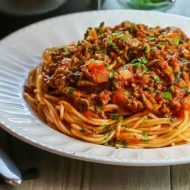 This recipe is full of not only classic flavor combinations, but it’s a perfect comfort food that’s thrown together in no time at all! 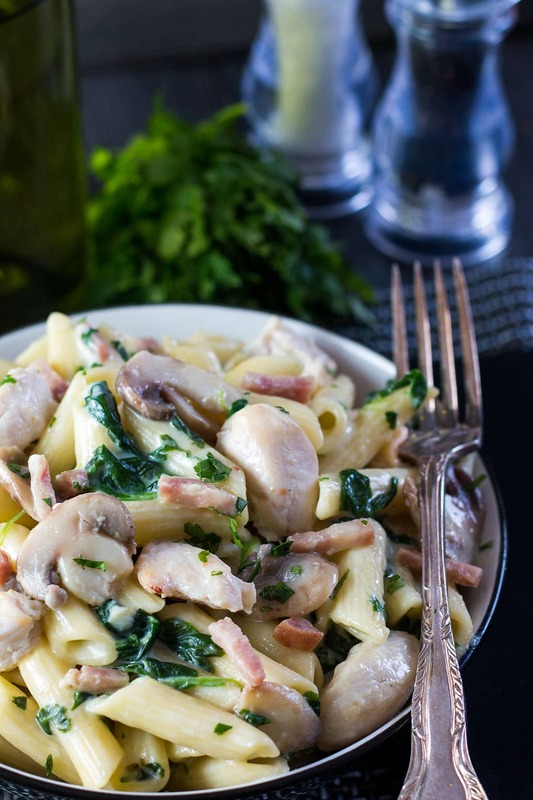 There’s nothing complicated about this Creamy Chicken and Bacon Pasta recipe, but it’s everything you could want when we need a comforting, tasty dinner at the end of a busy day. 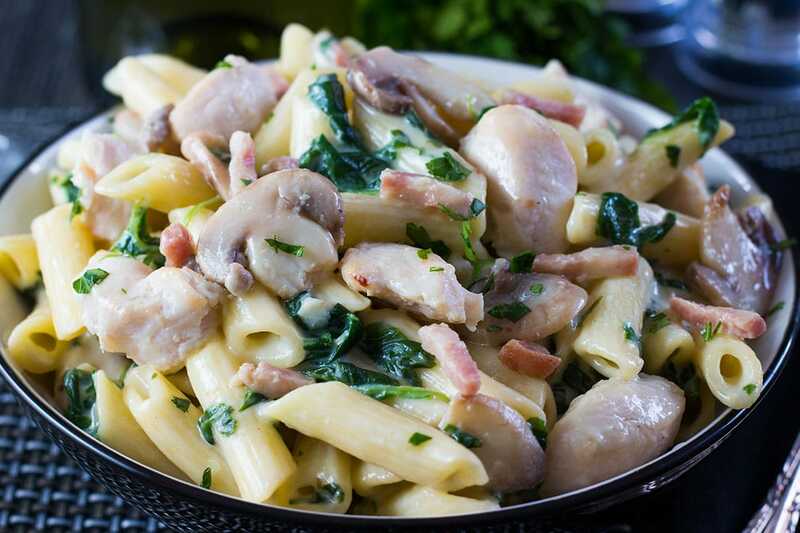 So serve up this Creamy Chicken and Bacon Pasta recipe for a last minute dinner guests and impress your friends with this quick dish. When cooking the bacon and chicken, if the oil gets too brown just discard it and wipe the pan before starting the next step. Don’t crowd the pan when cooking the meat or mushrooms. This will add steam and won’t allow it to brown properly. Make sure your pan is large enough. 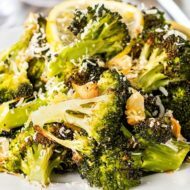 Adding different vegetables can give you a new dish every time you make it! 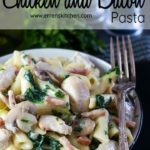 The day I took the photos for this post I used onions, mushrooms, and spinach, but I’ve made this recipe using anything from asparagus, peas, shallots, red onions and broccoli. 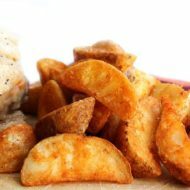 It’s really versatile and absolutely scrumptious! Heat one tablespoon of the olive oil in a deep, nonstick frying pan. Add the chicken breasts and bacon. Cook over a high heat for 4-5 minutes or until the chicken is no longer pink and the bacon is crisp. 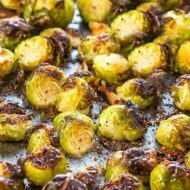 Heat the second tablespoon of olive oil. Add the onions and mushrooms, cook until the onions are translucent and mushrooms are cooked (about 5 minutes). Add the garlic and cook another minute. Pour in the wine and let it bubble over a high heat until it has virtually evaporated. 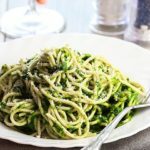 Add the spinach, the cream, pasta, and parsley. Season with salt and pepper, stir well. Cover the pan and cook for 4 minutes more until the chicken is cooked all the way through. Serve hot. Don't crowd the pan when cooking the meat or mushrooms. This will add steam and won't allow it to brown properly. Make sure your pan is large enough. 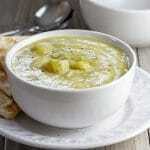 Adding different vegetables can give you a new dish every time you make it! 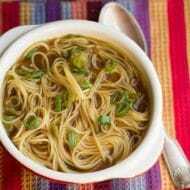 The day I took the photos for this post I used onions, mushroom, and spinach, but I've made this recipe using anything from asparagus, peas, shallots, red onions, and broccoli. 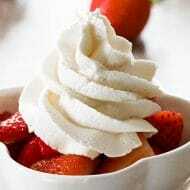 It's really versatile and absolutely scrumptious! MORE THAN ANNOYED.. went out and got the ingredients I needed.. It’s now 7pm and I’m about to start making it and come across the method section which says “Add the wine..”. Hi Natalie, I’m so sorry about this. 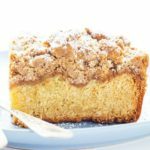 I recently republished the post and recipe (it’s even stated ar the bottom of the post) when I updated the recipe for nutritional information, I must have unintentionally left out the wine (It’s a half cup of white wine). 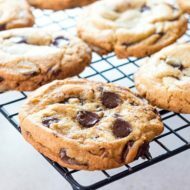 I can assure you all of the comments are left by people who made the recipe. As a side note, the recipe will work just fine without the wine if you still want to make it. Thank you for letting me know about the error. I depend on my readers to inform me of problems. I apologise again for any inconvenience. 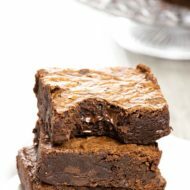 Hi Natalie, I’ve made this recipe a few times now and loved it (although the wine wasn’t missing when I made it), I’m a regular visitor on here and can tell you my comments are for real. Thanks Erren for all the great food! This is my kind of meal! 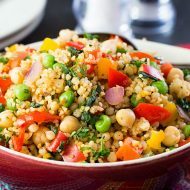 I also love that you can turn it into something completely different just by switching out for veggies you have on hand! Lol half these comments sound so fake. Personally I think it’s a wonderful dish. My critisism is that people don’t know how to write comments that don’t feel like the author is trying to write they’re own reviews. I’m not sure that’s a relevant comment, but I’ll post it anyway as I post all my comments – good, bad or indifferent. I can assure you, Guy, I don’t have the need to leave my own feedback.